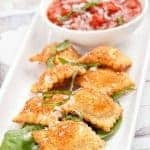 Crumb-coated mini ravioli, shallow-fried and served with marinara sauce for dipping make an appetizer that’s sure to please even the fussiest eater. Whisk the eggs and milk together in a pie plate or similar shallow dish. Combine the bread crumbs, garlic powder, onion powder, salt and pepper and spread evenly over a large plate. Heat about 1/4-inch of oil in a large skillet over medium-high heat (about 375°F). Add about half of the ravioli to the egg mixture and toss to coat thoroughly. Use a fork to transfer them one at a time to the crumb mixture. Turn each ravioli in the crumbs once or twice, pressing on them gently to be sure the crumbs adhere. Add the ravioli to the hot oil and fry until crisp and golden brown, 1 to 2 minutes per side at most. Drain on paper towels and transfer to a serving plate. Repeat the process with the remaining ravioli. Garnish with fresh basil and serve with marinara sauce for dipping.